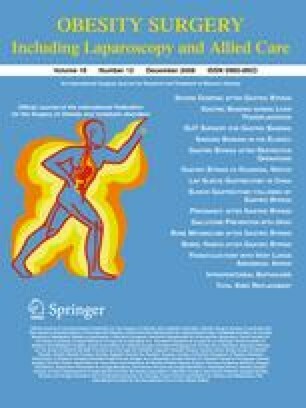 A prospective study assessment was made of 120 consecutive morbidly obese patients with body mass index (BMI) of 43 ± 5 (30 to 63), who underwent LSG using the following technique: (1) division of the vascular supply of the greater gastric curvature and application of the linear stapler-cutter device beginning at 6–7 cm from the pylorus so that part of the antrum remains; (2) inversion of the staple line by placement of a seroserosal continuous suture close to the staple line; (3) use of a 48 Fr bougie so as to avoid possible stricture; (4) firing of the stapler parallel to the bougie to make the sleeve as narrow as possible and prevent segmental dilatation. Intraoperative difficulties were encountered in four patients. There were no postoperative complications—no hemorrhage from the staple line, no anastomotic leakage or stricture, and no mortality. In 20 patients prior to the sleeve procedure, a gastric band was removed. During a median follow-up of 11.7 months (range 2–31 months), percent of excess BMI lost reached 53 ± 24% and the BMI decreased from 43 ± 5 to 34 ± 5 kg/m2. Patient satisfaction scoring (1–4) at least 1 year after surgery was 3.6 ± 0.8. The authors thank Ruth Fradkin for her assistance. Yehoshua RT, Eidelman LA, Stein M, et al. Laparoscopic sleeve gastrectomy—volume and pressure assessment. Obes Surg 2008 doi: 10.1007/s11695-008-9576-x.